Over thirty works of art including paintings by Monet and Picasso are reimagined by individual florists and garden clubs as floral arrangements in the Saint Louis Art Museum's Art In Bloom festival. 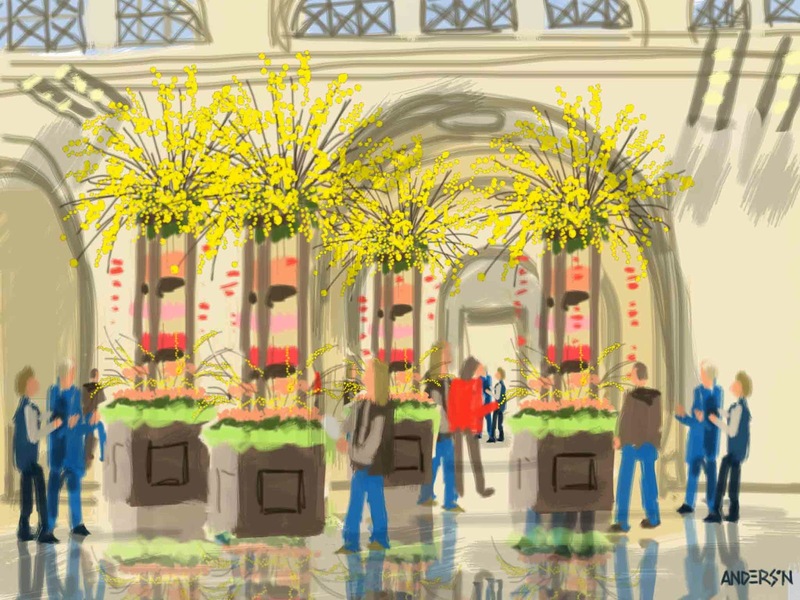 The annual event resumes this weekend after a five year hiatus during the construction of the new East wing, Massive sprays of forsythia topped off multi-level flower boxes placed in the grand hall in the main building. This sketch was completed during the member preview on Friday morning prior to opening to the public. Art In Bloom, St. Louis Art Museum, 02/28/2014, Michael Anderson, Brushes 3 for iPad with Sensu Solo Brush. Reflective floor, firework-like bursts of forsythia--you've captured the gala excitement, Michael!! Thank you for that great comment Marcia! It has been fun to see the SLAM filled with people since the new wing opened. 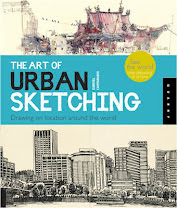 Urban Sketchers Midwest at The Elms!